“We don’t want to robotise our church work, but see if we can bring a theological perspective to a machine,” Krebs explained. Now this is interesting. Can a machine bless? What actually is a blessing? Are the programmed words spoken by BlessU-2 any less efficacious than a liturgical form of words blurted out mechanically by a cyborg vicar who doesn’t really give a damn? If a priest does not mean the words he (or she) proclaims, are they any more effectual than the fervent words spoken by a robot? Does blessing require a righteous spirit? Does it demand a right spirit? Does it require a spirit at all? Is a wrong spirit more unproductive than no spirit? Can Artificial Intelligence help plug the gap caused by plummeting vocations? Do we need incarnational absolution, or could a kind of church checkout machine make confession easier? If you can cut your time in Purgatory by following the Pope on Twitter, why can’t AI play a role in a ministerial team? It could certainly perform some of those innovatory liturgical functions which trouble the consciences of traditionalists, weighed down by centuries of dogma and truth. BlessU-2 has made the BBC and other mainstream media. It is clearly helping to raise awareness of that other revolution which began in Wittenberg 500 years ago. Its diodes and flashing bulbs are helping to spread the word, just like the printing press did for Martin Luther and his 95 Theses. 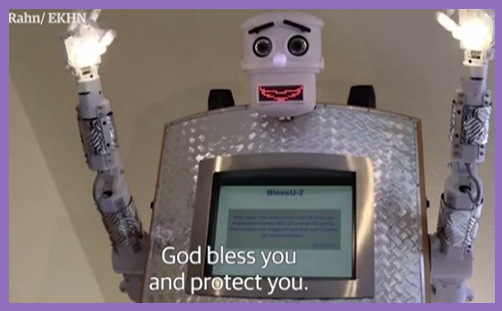 BlessU-2 is a conceit of postmodernity, a robot priest unhitched from the past and stripped of all values. It may represent a form of technological progress, but it is no substitute for incarnational apprehensions of truth and sacerdotal wisdom. People gather and are curious because anything on the cutting edge of robotics must be superior to the dullsville of God’s creation. And we persist with this delusion despite the fact that, while our lives are blessed with unprecedented wealth and unimaginable knowledge, society is plagued by emptiness, superficiality, banality and destructiveness. The church needs to remain human and be more human, more serious, and more profound, for real people are its wealth: ‘But we have this treasure in earthen vessels‘ (2Cor 4:7). Our task is to become holy disciples, captivated by Christ; not air-headed zombies, mesmerised by computers, contraptions and flashing gadgets.